We’ve been back from Vegas for a couple of days and, with the exception of a profoundly upsetting dream (so fun! ), it’s been a great week. We had a lovely time with our entire team in Vegas, we’ve landed two new clients since January 1st, and it was great to see all my friends. I do wish that everyone lived closer to each other, but I suppose that if we saw each other more than the handful of times every year, all our livers would explode. Today we took the kids to the movies which was great fun, mostly because we had them convinced that we were NOT going to the movies. (It’s our M.O. of course with them…though they’ve been more and more interested in actually gong to Alaska of late, so maybe we’ll have to change that up a bit.) 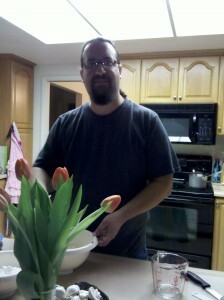 Now, I’m sitting in the kitchen, listening to some glorious fados, watching my sweet hubby make tempura for dinner and enjoying the tulips I treated myself with today. Oh how I love tulips! They’re definitely in my top 5…along with daffodils, lisianthus, heritage roses, and wisteria. It’s a bit early for tulips, so these are probably hot house, but they’re still very lovely. Now I just have to clear my desk of the things I brought back from Vegas to make room for them! bleeding like so many times before. in the gutter of its own making. and the depths of oblivion. I’ve been rather introspective lately…thinking about life and the dynamics that cast eddys and waves across my existance and I’ve started to notice I have cycles of creativity. I’m sure everyone goes through patches of writers block and such, but right now, I simply long for more. To do more, to be more. I want to wander into the woods for an hour simply to listen to my heartbeat and hear my breath mix with that of the trees. I want to dance free and vibrant like I was 5 and didn’t care what anyone thought. I want to break out my acrylics and delightedly fingerpaint. I want to spin florid words across crisp linen with purple ink and a fountain pen. I want to listen to jazz all day long and sing and weep. I want to sit in a meadow and eat fresh picked blackberries that stain my fingers. I want to wander through antique stores and smile at the trinkets and forgotten memories of souls long since past. I want to sit in silence and weave stories from the depths of my being. I want to cast hugs and kisses upon old friends. I want to cry out the joy in my heart from the highest mountain and whisper it to the lowliest pebble. I want to ground myself to the earth and strain to kiss the sky. When I originally had to learn the Old English pronunciation of the first 42 lines of Geoffery Chaucer’s The Canterbury Tales in Kathy Kernberger’s Honors English class at college, I wasn’t really sure when or if I would ever find it useful again. You’d be surprised at how many times this seems to come up in my life. When one of my friends on The Cape Radio hosted the Poetry Slam last week, it only seemed fitting to record it and send it in as my offering.